Christian Rowland Reporting live for ODOGWU MEDIA....The Nigerian Senate, on Wednesday was thrown into a rowdy session as it was about recording the first official cross-carpeting for the year 2018. Senator Sonni Ogbuoji ( Ebonyi South) had come under order 43 of the rules of the Senate to announce his official defection from the Peoples Democratic Party (PDP) to the ruling All Progressives Congress (APC). 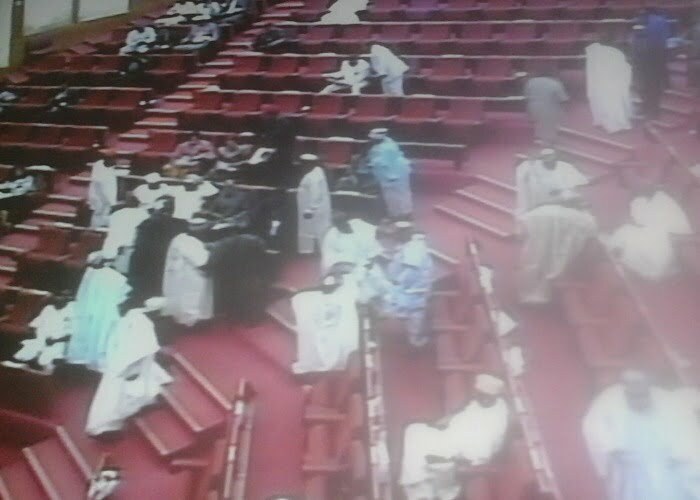 Members of the PDP and APC didn’t allow Ogbuoji to finish when the floor was thrown into rowdiness, with the APC Senators dragging the new defector to their wing while PDP lawmakers scampered to rescue him to their wing. Having brought the floor to decorum, Senator Ogbuoji, in a twist of event, announced that he was withdrawing his earlier announcement. “I came under order 43 with the intention that I needed to make some declarations this morning. But my party, the PDP felt I had not consulted with them enough. So, because of the love they had shown to me in the past, I’m stepping down my decision to decamp”, Ogbuoji declared. Responding, the President of the Senate, Dr Bukola Saraki who presided over the plenary, did not object to the withdrawal of statement of defection. He said, in line with our rules, we cannot debate on this. But, Senator Sonni, I’m going to keep the whole day for you, in case you wish to come under order 43 again and perfect your defection,” Saraki said jokingly.